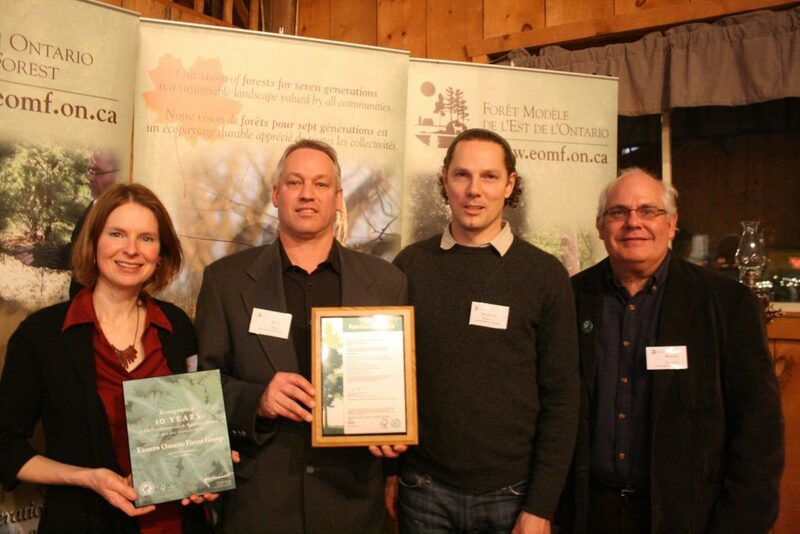 The Eastern Ontario Model Forest (EOMF) recently celebrated the 10 year anniversary of its Forest Certification Program. (L to R): Vivian Peachey The Eastern Ontario Model Forest (EOMF) recently celebrated the 10 year anniversary of its Forest Certification Program. In addition to accolades acknowledging the 10th Anniversary of this successful Program, the Rainforest Alliance presented Scott Davis, the EOMF’s Forest Certification Coordinator, with its third Five Year Forest Stewardship Council® (FSC®) Certificate along with a 10 Year commemorative plaque. From the humble beginnings, the EOMF Forest Certification Program now includes over 135 forest owners and nine community forests representing over 55,000 hectares of FSC-certified forest throughout southern Ontario. Wade Knight, the EOMFs General Manager, gave the audience an informed overview of the 10 years progression of the EOMF program. The EOMF thanks its many partners, supporters and friends that have contributed to its Program over the years. Of notable mention are its founding partners, the Ontario Woodlot Association, Domtar Cornwall, and the Ontario Ministry of Natural Resources. The EOMF also wishes to acknowledge the support and help it has enjoyed and appreciated along the way from individuals, companies and organizations in the forest industry, at all levels of government, NGO’s, First Nations partners, consultants and service providers, staff and others too numerous to mention that have contributed to the program’s growth and success.